Blazing trees and Lake Superior lore color the quiet of the Keweenaw Peninsula. A dash of lonesome can add a nice edge to a vacation, especially in fall. We’re talking Johnny-Cash-singing-about-trains lonesome. Rain-pelting-the-window-while-the-coffee-brews lonesome. Good lonesome. The kind Michigan’s Keweenaw Peninsula delivers in just the right dose. Like when you stand, collar up, on the beach outside Fitzgerald’s, a restaurant named for Lake Superior’s most famous shipwreck. It marks where the forest, already painted by autumn in late September, gives way to sand, which angles down into the forever of Lake Superior. A cool breeze here at dusk feels right when your mind is braced by sailing stories and you know that warming up is as close as the window glowing behind your back. Such moments are the specialty of the Keweenaw, the outlier of the outlier, the farthest reach of the Upper Peninsula, which is already practically a state unto itself. There will be no crowds when you get there (or cell service, for the most part). Just the land and the lake and a constant sense of the past making the present all the more compelling. Every visitor passes through Houghton/Hancock, hub cities on the shipping canal that cuts across the Keweenaw (KEY-wuh-naw). The cities’ population—about 13,000—is a shadow of the 60,000 opportunists and dreamers who flocked to the copper mines from about 1900 through 1920. 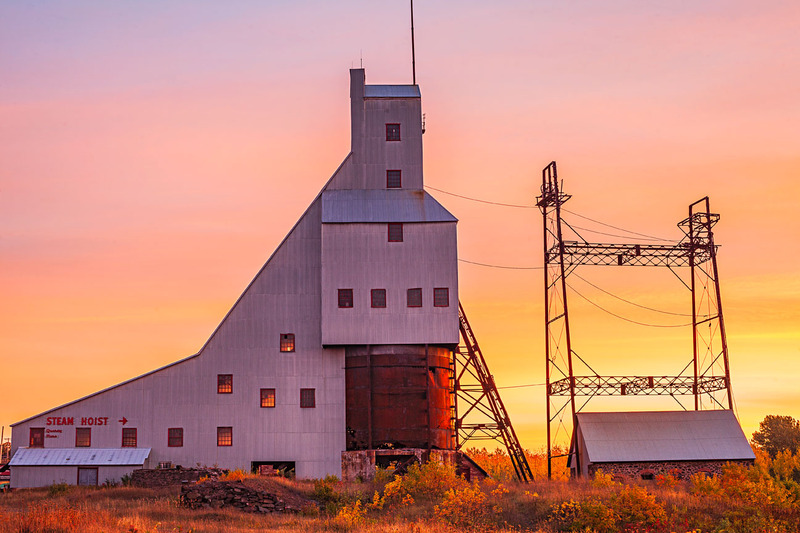 Standing outside the cities as a monument to the boom is Quincy Mine’s angular elevator shaft, maintained by the Quincy Mine Hoist Association. Tourists rifle through canvas-and-wool coats and yellow hard hats looking for a good fit. Robed like pseudo-miners, they ride a red cogwheel tram steeply downhill until they feel the mine’s breath: musty, 47-degree air seeping from the entrance. Boarding a tractor-pulled trailer, they putter into darkness seven levels below the surface. The mine is one of 22 sites around the peninsula that make up the Keweenaw National Historical Park, collectively revealing the story of how the area once provided most of the nation’s copper. Sites include a quiet cabin at Old Victoria, a copper baron’s opulent mansion at Laurium Manor, a restored fort in Copper Harbor and a variety of local museums, including a visitors center in Calumet. Thirty thousand people once lived within walking distance of Calumet, which dreamed of dethroning Chicago as capital of the Midwest. Today, less than 1,000 souls remain, surrounded by the faded Gothic glory of ornate brick buildings and looming copper works. In a church-turned-art-center, women gather to make copper jewelry. Down the block, Peter Hahn hammers the metal into bracelets and glittering ornaments. And on the outskirts of town, glassblower Richard Dana’s vases, bowls and wall art made from melted bottles seem to waver, bubble and catch the light like a cold ripple on the lake. “There were over 33 nationalities here,” says Kathleen Harter with the National Park Service, ticking off Cornwall, Ireland, Canada, Italy, Greece, China and others that sent workers here until a 1913–14 labor strike, the Great Depression and war conspired to turn the copper boom to bust. The melting pot evaporated as families migrated to Detroit to build cars, but the Finns clearly stayed. Blue-and-white flags fly from homes and docks, and businesses and street signs sport the tongue-tripping double vowels of Finnish heritage. At Sheridan on the Lake B&B in Houghton, owner Barbara Briggs says, “You’re going to have a typical Finnish breakfast—for a special occasion,” as she presents light, custardy pannukakku (pancakes) with warm raspberry sauce alongside lemon-glazed nisu, a cardamom-scented egg bread that guests slather with thimbleberry jam. 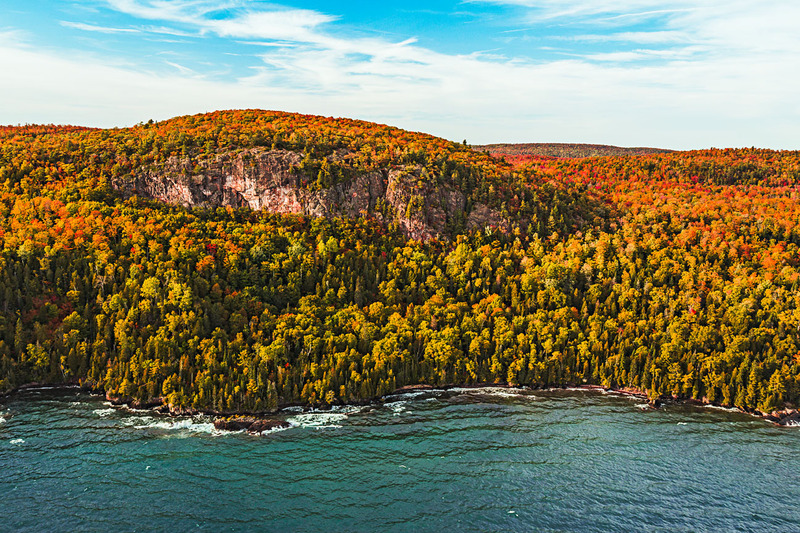 Northeast of Calumet, the Keweenaw’s go-to scenic drives await. M-26 traces the shoreline past rocky outcrops, pebbled beaches and Fitzgerald’s (which lures diners with smoked meats, microbrews and a notable lineup of whiskeys). The northernmost 11 miles of US-41 wind through a kaleidoscopic tunnel of trees toward the hamlet of Copper Harbor on a road barely wide enough for two cars to shoulder by one another. The town (one hour from Houghton/Hancock) represents the edge of civilization in Michigan and provides a base for biking, hiking and kayaking excursions through the Keweenaw Adventure Company. 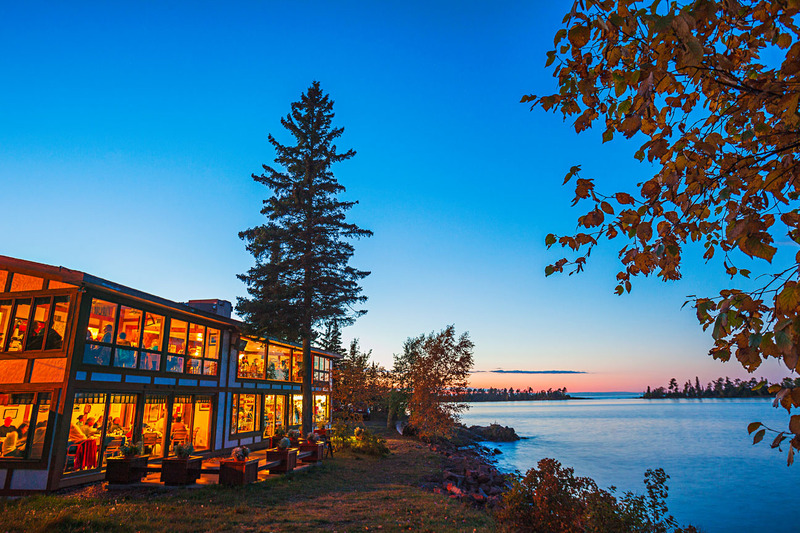 Many active days end with a meal at the Harbor Haus, where windows provide passing views of the ferry to Isle Royale National Park and dishes include expertly sauced fish and chocolate soufflés drizzled with crème anglaise. The Harbor Haus in Copper Harbor looks out on ferries traveling to Isle Royale. Just west of Copper Harbor, a bumpy paved road heads uphill through the forest. 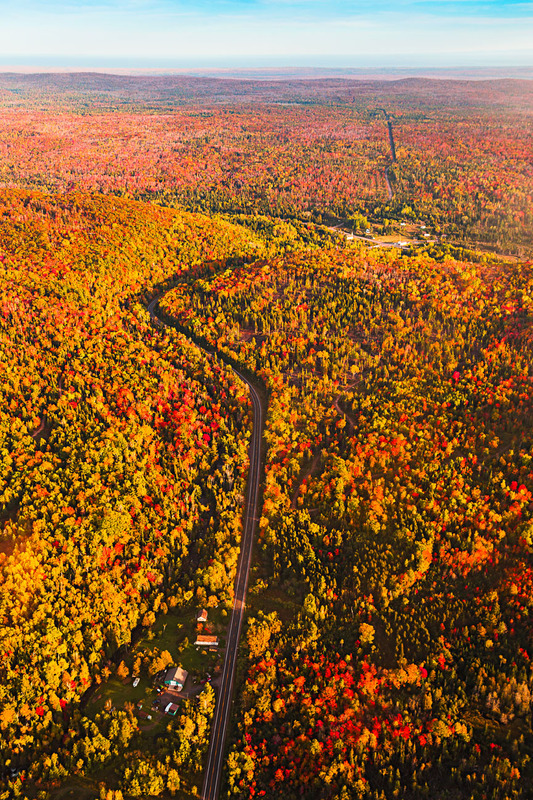 The 9-mile scenic drive built in the 1930s meanders along the spine of Brockway Mountain, topping out at West Bluff. From the peak, neon birch, electric maples and metallic oaks spread in every direction, circling an inland lake and running out at Lake Superior’s shore. If the copper market had held up, you might be looking out at suburbs from this spot. Instead, rock, water, wind and forest are still in command. And they’re welcoming hosts to anyone willing to trade autumn crowds for a few whispered legends. Scenic drives Two of the top drives for fall color: M-26 north of Calumet to Copper Harbor (watch for pullouts to see waterfalls and coves) and US-41 from Copper Harbor to Lac La Belle Road. Fact check: It's US-41, not M-41.